If you are a pilot, a wannabe pilot or just want to enjoy the adventure of flying a light aircraft to strange and wonderful places, this is for you. Two CD-ROMS allow you to: Adventure to The Top of the World at 83.5 degrees north latitude, to Alaska and the Canadian High Arctic, across the North Atlantic and to the Carribean. Click on the image for more information. 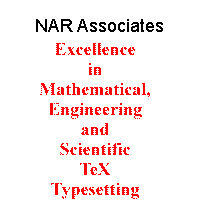 NAR Associates has extensive long term experience in TeX book publishing with several major US and European publishers. We work closely with authors and/or publishers to turn electronic copy into attractive books. We offer complete freelance production services, including design, copy editing, layout and typesetting. We specialize in engineering, science, computers, computer graphics, aviation and medicine. Click on the image for more information. NAR Publishing currently features three books by David F. Rogers. Laminar Flow Analysis is available for a limited time directly from the author at a significant savings. The complete table of contents, a sample chapter and a set of sample problems are available. Click on the image for more information. The complete tables of contents for Professor Rogers computer graphics books, Mathematical Elements for Computer Graphics and Procedural Elements for Computer Graphics, as well as online ordering information, are also available. Click on the image for more information.